​DESTROYIT 2503 - Compact, entry model Centralized Office shredder with a 10 1/4 inch feed opening and 20 gallon shred volume. Comprehensive SPS™ safety package: Easy Switch control element uses illuminated color codes and symbols to indicate operational status and functions as an emergency stop switch; patented, electronically controlled, transparent safety shield in the feed opening; automatic power cut-off when cabinet is opened or shred bin is full; automatic reverse and power cut-off when overfed; double protection against overheating; Zero Energy Consumption sleep mode cuts off power supply after 30 minutes of inactivity. ​Automatic start and stop controlled by photo cell. High quality, hardened steel cutting shafts take staples, paper clips, and credit cards (strip-cut model takes CDs / DVDs). Lifetime warranty on the cutting shafts. Quiet and powerful single phase motor. Fully enclosed gear box housing. High quality wooden cabinet mounted on casters. Convenient, environmentally friendly shred bin does not require disposable shred bags. DESTROYIT 2604 - Powerful shredder with ECC (Electronic Capacity Control) indicator and an automatic oiler on cross-cut and high security models. Comprehensive SPS™ safety package: Easy Switch control element uses illuminated color codes and symbols to indicate operational status and functions as an emergency stop switch; patented, electronically controlled, transparent safety shield in the feed opening; automatic power cut-off when cabinet is opened or shred bin is full; automatic reverse and power cut-off when overfed; double protection against overheating; Zero Energy Consumption sleep mode cuts off power supply after 30 minutes of inactivity. ​Automatic start and stop controlled by photo cell. Patented Electronic Capacity Control (ECC) indicator prevents jams by monitoring sheet capacity levels during operation. Automatic oil injection ensures optimal performance at all times (cross-cut and high security models). High quality, hardened steel cutting shafts take staples, paper clips, credit cards, and CDs / DVDs (strip- and cross-cut models). High security models meet all NSA/CSS specifications and are DOD approved. Lifetime warranty on the cutting shafts (strip- and cross-cut models). 1 year warranty on high security cutting shafts. Quiet and powerful single phase motor rated for continuous operation. Sturdy Twin Drive System with fully enclosed gear box housing. High quality wooden cabinet mounted on casters. Convenient, environmentally friendly shred bin does not require disposable shred bags. DESTROYIT 3104 - Wide, 12 inch feed opening and a sturdy single phase motor rated for continuous operation. Shred volume is a hefty 32 gallons. Comprehensive SPS™ safety package: Easy Switch control element uses illuminated color codes and symbols to indicate operational status and functions as an emergency stop switch; patented, electronically controlled, transparent safety shield in the feed opening; automatic power cut-off when cabinet is opened or shred bin is full; automatic reverse and power cut-off when overfed; double protection against overheating; Zero Energy Consumption sleep mode cuts off power supply after 30 minutes of inactivity. ​Automatic start and stop controlled by photo cell. Patented Electronic Capacity Control (ECC) indicator prevents jams by monitoring sheet capacity levels during operation. High quality, hardened steel cutting shafts take staples, paper clips, and credit cards (strip-cut and 4 x 40 cross-cut models take CDs / DVDs). Lifetime warranty on the cutting shafts. Quiet and powerful single phase motor rated for continuous operation. Sturdy Twin Drive System with fully enclosed gear box housing. High quality wooden cabinet mounted on casters. Convenient, environmentally friendly shred bin does not require disposable shred bags. 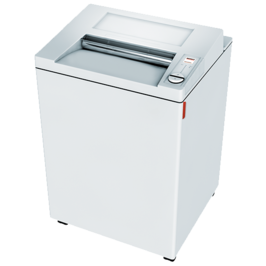 The FD 8402CC Cross-Cut model can shred up to 26 sheets at once, up to 33 feet per minute, with a shred size of 5/32" x 1 1/5". The FD 8402SC Strip-Cut model can shred up to 32 sheets at once, up to 30 feet per minute, with a shred size of 1/4". In addition, the new ECO mode saves energy by automatically switching into standby mode after 5 minutes of inactivity. The optional EvenFlow™ Automatic Oiling System periodically lubricates the cutting blades based on motor run time, keeping the shredder in peak operating condition. The FD 8502CC Cross-Cut model can shred 23-25 sheets at a time, up to 35 feet per minute, with a shred size of 5/32" x 1 1/5". The FD 8502SC Strip-Cut model can shred up to 22 sheets at once, up to 33 feet per minute, with a shred size of 5/32". Heat-treated steel blades, a steel cabinet, lifetime guaranteed waste bin, and a powerful AC geared-motor ensure years of reliable performance and information security in your office environment. In addition, the ECO Mode saves energy by automatically switching into standby mode after 5 minutes of inactivity. The optional EvenFlow™ Automatic Oiling System periodically lubricates the cutting blades based on motor run time, keeping the shredder in peak operating condition. ​ In addition, the ECO Mode saves energy by automatically switching into standby mode after 5 minutes of inactivity. The FD 8602CC Cross-Cut model can shred up to 37 sheets at a time, up to 22 feet per minute, with a shred size of 5/32" x 1 1/5". The FD 8602SC Strip-Cut model can shred up to 31 sheets at once, up to 30 feet per minute, with a shred size of 1/4". Commercial-grade components include heat-treated steel blades, a steel cabinet, lifetime guaranteed waste bin, and a powerful AC geared-motor to ensure years of reliable performance and information security in your office environment. ​In addition, the new ECO mode saves energy by automatically switching into standby mode after 5 minutes of inactivity. The optional EvenFlow™ Automatic Oiling System helps to keep the FD 8602CC and FD 8602SC in peak operating condition. The FD 8650CC is an office-size shredder with industrial strength, and shreds up to 32 sheets at one time at speeds up to 33 feet per minute. The extra wide feed opening handles documents up to 16” wide and the large waste bin holds up to 53 gallons. These specifications make it an ideal centralized office shredder. In addition, the ECO Mode saves energy by automatically switching into standby mode after 5 minutes of inactivity. DESTROYIT 3105 - Automatic oil injection system ensures optimal performance at all times. High speed and sheet capacity make it ideal for high volume shredding. Comprehensive SPS™ safety package: Easy Switch control element uses illuminated color codes and symbols to indicate operational status and functions as an emergency stop switch; patented, electronically controlled, transparent safety shield in the feed opening; automatic power cut-off when cabinet is opened or shred bin is full; automatic reverse and power cut-off when overfed; double protection against overheating; Zero Energy Consumption sleep mode cuts off power supply after 30 minutes of inactivity. Standard features include heat-treated steel blades, an easy-to-use LED control panel, lifetime guaranteed waste bin, and a powerful AC geared-motor. In addition, the new ECO mode saves energy by automatically switching into standby mode after 5 minutes of inactivity. The optional EvenFlow™ Automatic Oiling System helps to keep the FD 8704CC in peak operating condition. DESTROYIT 3804 - Attractively priced Centralized shredder with ECC (Electronic Capacity Control) and a super wide, 16 inch feed opening. Shred bin holds 44 gallons. Comprehensive SPS™ safety package: Easy Switch control element uses illuminated color codes and symbols to indicate operational status and functions as an emergency stop switch; patented, electronically controlled, transparent safety shield in the feed opening; automatic power cut-off when cabinet is opened or shred bin is full; automatic reverse and power cut-off when overfed; double protection against overheating; Zero Energy Consumption sleep mode cuts off power supply after 30 minutes of inactivity. DESTROYIT 4002 - Heavy duty, 1 3/4 horsepower motor makes the 4002 a perfect fit for continuous, high volume shredding environments. Cross-cut models are equipped with an automatic oiler. Comprehensive SPS™ safety package: Easy Switch control element uses illuminated color codes and symbols to indicate operational status and functions as an emergency stop switch; patented, electronically controlled, transparent safety shield in the feed opening; automatic power cut-off when cabinet is opened or shred bin is full; automatic reverse and power cut-off when overfed; double protection against overheating; Zero Energy Consumption sleep mode cuts off power supply after 30 minutes of inactivity. ​Automatic start and stop controlled by photo cell. Patented Electronic Capacity Control (ECC) indicator prevents jams by monitoring sheet capacity levels during operation. Automatic oil injection ensures optimal performance at all times (cross-cut models). High quality, hardened steel cutting shafts take staples, paper clips, credit cards, and CDs / DVDs. Lifetime warranty on the cutting shafts. Quiet and powerful single phase motor rated for continuous operation. Sturdy Twin Drive System with fully enclosed gear box housing. High quality wooden cabinet mounted on casters. Convenient, environmentally friendly shred bin does not require disposable shred bags. DESTROYIT 4005 - Our most powerful Centralized Office shredder comes with an automatic oiler and ECC (Electronic Capacity Control).Comprehensive SPS™ safety package: Easy Switch control element uses illuminated color codes and symbols to indicate operational status and functions as an emergency stop switch; patented, electronically controlled, transparent safety shield in the feed opening; automatic power cut-off when cabinet is opened or shred bin is full; automatic reverse and power cut-off when overfed; double protection against overheating; Zero Energy Consumption sleep mode cuts off power supply after 30 minutes of inactivity. ​Automatic start and stop controlled by photo cell. Patented Electronic Capacity Control (ECC) indicator prevents jams by monitoring sheet capacity levels during operation. Automatic oil injection ensures optimal performance at all times. High quality, hardened steel cutting shafts take staples, paper clips, credit cards, and CDs / DVDs (strip- and cross-cut models). High security models meet all NSA/CSS specifications and are DOD approved. Lifetime warranty on the cutting shafts (strip- and cross-cut models). 1 year warranty on high security cutting shafts. Quiet and powerful single phase motor rated for continuous operation. Sturdy chain drive with fully enclosed gear box housing. High quality wooden cabinet mounted on casters. Convenient, environmentally friendly shred bin does not require disposable shred bags.